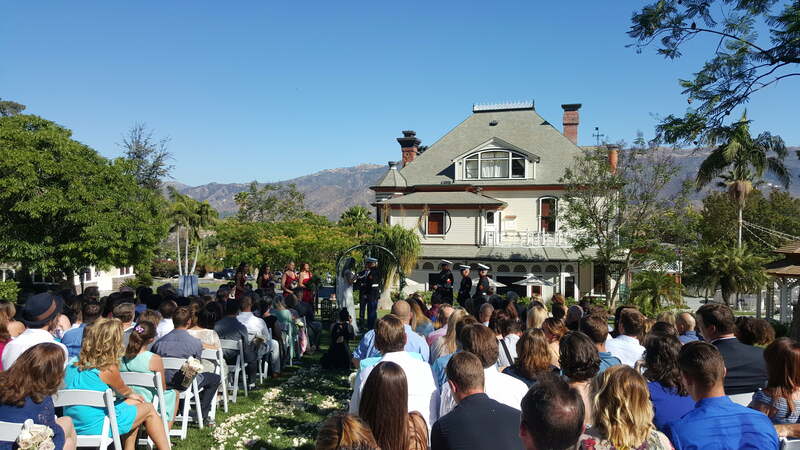 The Newhall Mansion in Piru is an amazing venue when planning your next wedding. I recently worked another wedding at Newhall mansion and I must say, it’s one of my favorite outdoor venues in the Santa Clarita area, just about 10 miles west of Santa Clarita to be exact. The Wedding ceremony space is just off the side of the house with plenty of space to accommodate your guests. there are several ways to set up the ceremony from having it under a tree to facing the mansion. depending on the time of year, especially during the summer, if you were to start the ceremony about 5:00 pm you would have enough shade from the trees to avoid the sun beaming on your guests. My favorite part of the reception area is that there is plenty of space for your guests to enjoy, whether its hanging out at the Bar gazebo or relaxing by the pool area. Most weddings will have the Buffet located inside the mansion which also provides a kitchen for the staff. There is plenty of lighting form the market lights to the house lighting, but having uplights located around the venue can add that special touch to the atmosphere. This entry was posted in Blog and tagged Best wedding Dj santa Clarita, Newhall Mansion Dj Santa Clarita, Wedding Dj Piru on June 10, 2016 by Graham Silver.